McAllen Memorial Coach of the Year, Lorena Lopez at McAllen Memorial on Monday Dec.11,2017, in McAllen. 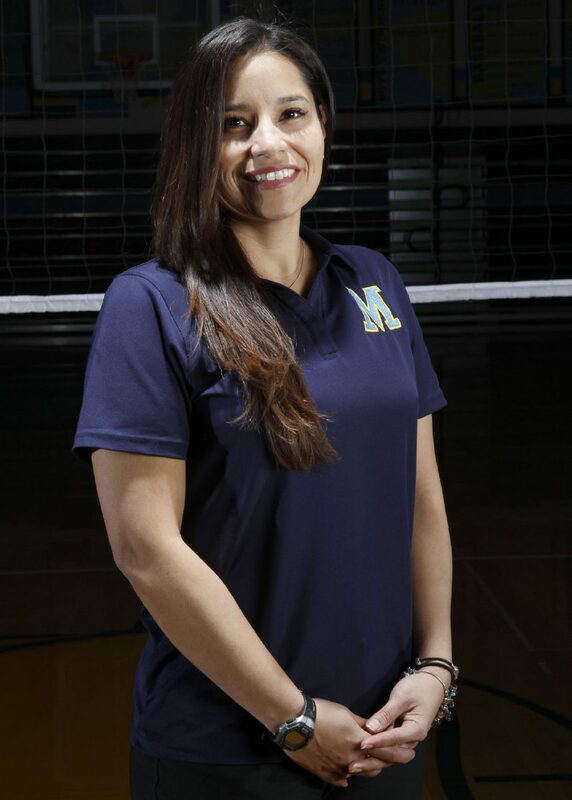 McAllen Memorial’s Lorena Lopez is The Monitor’s Coach of the Year. McALLEN — McAllen Memorial coach Lorena Lopez entered the 2017 season off a 40-win campaign by a Mustangs team that used senior savvy to put another serious playoff run in the record books. But the opener to the new season was a challenge: a road match at Mission Veterans. Not only did the Mustangs lose in four games with a starting lineup featuring only one senior, but they learned they would be without middle hitter Lanie Nitsch for the remainder of the season. Nitsch earned a spot on The Monitor’s All-Area First Team in 2016. Under Lopez’s direction, Memorial (31-9) shook off the rust, contended for a district title and became one of two Valley programs to qualify for the UIL Class 6A Sweet 16, joining McAllen Rowe. Lopez’s season earned her All-Area Coach of the Year honors. Lopez knows when the turning point in the season took place. Underclassmen like Jocelynn Everage, Valeria Trevino, All-Area Newcomer of the Year Sydney Marburger and others raised their level of play for the remainder of the district season. Memorial’s final regular-season match came against McAllen Rowe as the two teams were tied atop the district standings at 10-1. Rowe won the match and the district title on Memorial’s home court, but that didn’t stop the Mustangs heading into the postseason. Memorial raced through the first three rounds of the playoffs against Del Rio, PSJA Memorial and Laredo Alexander, surrendering just one game in those three matches. The Mustangs, despite how unlikely it may have seemed in early August, made their third consecutive appearance in the Sweet 16.